Judging by the nudge in the ribs this morning, Sandy evidently wanted me to get up with the kids so I rose to the challenge, went to get Jennifer and duly slept for another half an hour with her on my lap on the sofa in the front room. I would have slept even longer had Jennifer not started to get restless and Joey not started to wake. Ironically, we weren’t up and about that long before Sandy got up herself anyway. She has a terrible time trying to go back to sleep once she’s awoken in the mornings. We were to spend the day today with AnnMarie, as it was her day off work. She still had some errands to run this morning so we took our time getting ready and made our way over to the Waffle House on Beach and Third Street - again. They are getting very familiar with us there now. Sadly, our waitress often gets our orders mixed up but the cook listens in when we place the order and makes sure that we get what we want regardless of whatever it is that the waitress calls in. After breakfast, we drove over to East Hampton, where we let the kids run around in the playground there for half an hour whilst we waited for AnnMarie to show up. Since we were bound for the shopping malls today, it was good to get the kids active now since they likely wouldn’t have much of a chance to do so whilst at the mall. On the way to the Avenues mall at the end of Southside Boulevard, we stopped at a retail plaza where there’s a Linens-n-Things shop. Sandy wanted to see if we might find a bed set that included the quilt covers whilst I waited in the car with the kids. She never did find the sets she was looking for but still emerged with a few bags nevertheless - and laden two individual fury quit covers instead. We moved on to the Avenues mall and spent the next hour or so (it seemed more like half a dozen to me) looking for everything and nothing. We seemed to spend an inordinate amount of time shopping for kids’ clothes everywhere we went. We must have crammed in a good year’s worth of clothes shopping in the space of just a few days. If there were a section for speed shopping in the Guinness Book of Records, then Sandy would surely be a strong contender. After we were done with shopping (which wasn’t a moment too soon in my considered opinion), AnnMarie took us to her sister Angela’s house for some lunch. It was good to see Angela again and she laid on some lovely food for us. Sadly, it was mostly food that we don’t eat and I did feel a bit guilty about inadvertently offending her slightly. Still, the kids were very comfortable there and played contentedly with all the toys from the other children that live there. We drove back to East Hampton again, where AnnMarie cooked a lovely meal plentiful enough to feed the forty-thousand (bless her). We did have to make an impromptu trip to the nearby Publix supermarket to pick up some BBQ firelighters. The self-starting coals that Satya had seemed to do anything but self-start. It was a bit surreal this afternoon in that we went places that we’d been countless times in the past when we lived here and it really does seem like we’ve not been away. 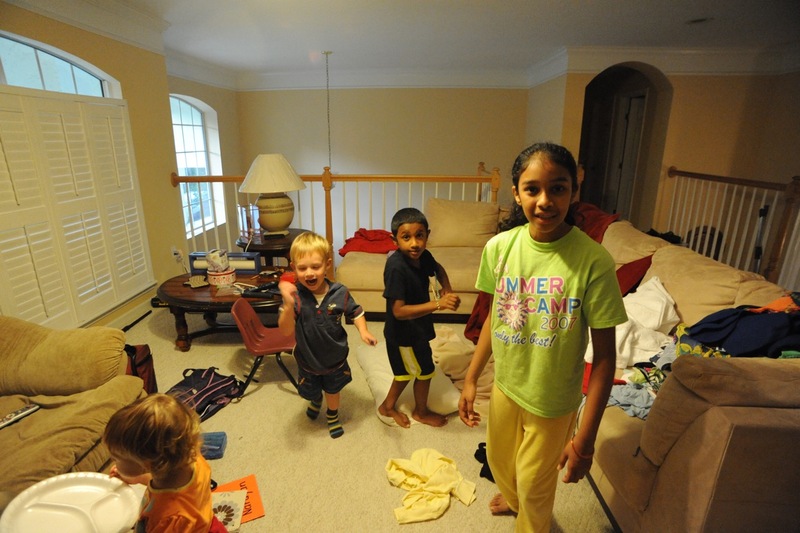 The delay with getting the BBQ up and running meant that dinner was a late affair but it did allow plenty of time for the kids to just be kids and run around in good sprits with Narayan and Kavitha. We left AnnMarie & Satya’s house along with AnnMarie’s laptop so that I could copy some software onto it (which I’m in the middle of doing right now). On the way home, we received a text message from Jennifer. Apparently, Pepere (Dave’s Dad) has a heart murmur. He’s not long ago been operated on and had heart by-pass surgery and it appears that one of the arteries might be leaking. They are going to operate on him tomorrow to try to fix the problem. Anyway, Duck (Dave’s Mum) is staying with Dave and Jennifer overnight and she and Jennifer are going to be joining us for breakfast tomorrow morning. The hope is that it will help keep Duck’s mind occupied. So, another late night writing up the blog entry but it’s done now and I can relax and finally curl up for the night.